Brace yourselves, this is going to be a long one, and it's just part one. One simple fact about K'nex is that they were never intended to be projectiles. In fact, they make for rather poor projectiles if we're being honest with ourselves. But that doesn't stop us from trying! One member, Oodalumps, was experimenting with different pieces and combinations of rods and connectors to see which flew the farthest and most accurately. 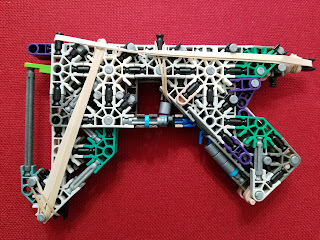 What he ultimately found was that a three-slot connector with a white rod in the middle slot was the best pure K'nex ammo, and so he dubbed it Oodammo. Since the creation of Oodammo, many single-shot launchers were made that fired it. However, because of their awkward shape, it wasn't immediately apparent how to make a repeater that fired them. Both the user Bakenbitz and I saw the opportunity to attempt putting out the first Oodammo repeater. I had just barely beat him out. Sadly, once again, I'm unable to find any pictures for his pistol. Mine was thrown together under the same pattern as my previous assault pistols. And so was born the Oodassault series. It was fairly crude for the sake of being one of the first ones made so I didn't intend to post it. I had seen another pattern of barrel and trigger used for other assault pistols and liked them, so I decided I'd try to build another Oodammo pistol following them. And so was born the Oodassault 2 soon after. It was large and somewhat ugly. Since bakenbitz's pistol was also large, I decided I'd rather sacrifice range for compactness as an alternative option. For some reason I dubbed this the Oddassault 2.5 though the only changes were made all at once. This I saw good enough to get instructions for, and it saw reasonable success on Instructables. It's still decent to this day as far as piece efficiency goes, but it was never designed to be amazing. It'd quickly fall obsolete compared to other Oodammo pistols flooding in. One popular design was the MeZak pistol, a collaboration between two other skilled builders, Zak and Mepain. Once again, I cannot find a picture of it. It introduced a tilting magazine and locking mag follower to make reloading much easier, else with most Oodammo pistols you had to take out the follower and slowly thread the Oodammo in one by one. It was also built to be more durable and handle more bands, ultimately making it perform much better. But it was bulky in my opinion, and I didn't like how the magazine looked. One day another user named DJ Radio showed off his Oodammo pistol with a slide. It was very bulky and, if I'm honest, I just disliked his ego, so I figured I'd try to show him up. It was odd of me to come up with such a unique design so quickly (most of my inspiration came from other people's concepts but modified to my style) but I turned this out I believe the same or next day after seeing his pistol. And so was born the Oodassault 3. It was much more compact than his offering, so I felt satisfied. However, despite what I originally thought, slides never really benefited launchers. They added extra complication and typically weakened the design while only marginally making it easier to charge the launcher. I was also not fond of the fixed magazine. I saw potential in my design, so I decided to improve it. I posted this version, but I don't want to link to instructions because it's an inferior design in most ways. Instead of holding the magazine tilted with your finger, this one broke open and remained open. I also came up with a method for loading this with stripper clips to make reloading much quicker. However, it suffered from reliability issues with having such a large magazine, and I didn't really like how it was weakly attached to the launcher. So I set out to do some redesigning. This is the 3.6, the next version I would post after several revisions. Changes included shrinking the magazine and attaching it differently, giving it a sliding tilter, and adding a safety. This one performed much better and would serve as the new base for improvements going forward, but it still wasn't quite perfect. If you couldn't tell already, I was really serious about making the Oodassault 3 series the best it could be. The 3.7 had a few usability enhancements to make it more reliable. I also changed the sliding tilter to allow the magazine to tilt out more and to catch on the trigger guard to take some of the stress of holding it open off your fingers. I was content with this version for a while. Killerk then used the body of this launcher with the magazine design from the MeZak and a few of his own touches to make his own pistol, the DunKillMeZak. Basically, his priorities were in making the magazine lock open again instead of needing to be held open, and then in using the guide poll as a clip of sorts for quick reloading. I didn't like the magazine design so much, so I set out to accomplish his goals with my own style. This was the 3.8. In addition to changing the magazine to lock open again like with the 3.3, I did the clips a little differently to allow them to be left in the magazine, making reloading extremely quick. This was my last version for a while. I grew older, went to college, got jobs, etc. and was fairly busy and not building as often. So whenever I felt like getting back into building, I'd often rebuild the Oodassault 3 and try to think of any improvements I could make. The first time I did this, I made this. Little changes here and there once again. I always meant to post something since I had made so many little improvements since the last time I posted a version, but I never did. And then a lot of time would go by again without me building. Once again a few months I tried getting into building again and I started working on the 3.10. Still, it was just small little improvements here and there, a slightly more comfortable trigger and an easier to use mag follower. I may post instructions of it soon, but I've been wanting to make even more improvements upon it, so we'll see what happens. So that concludes specifically the Oodassault series. It has been my pride and joy for a while, and still likely what I'd take to a K'nex battle if I ever participated in one. In another post, I will go over other Oodammo-based launchers I've made.